As technology evolves at a quicker pace than ever before, keeping up with current technology trends has become a quintessential skill for marketers to build timely and relevant content that would resonate with the audience on social media. With the increase in popularity of VR (Virtual Reality) in recent years, our team decided to incorporate this technology into a recent marketing campaign for our client The North Face Vancouver, to engage their existing followers and attract a younger audience to participate in a #FindOurTeam VR game, where they can win prizes by completing the game's challenge. In the challenge, participants were asked to find various The North Face Vancouver team members by navigating through a virtual space within the Kitsilano North Face store. 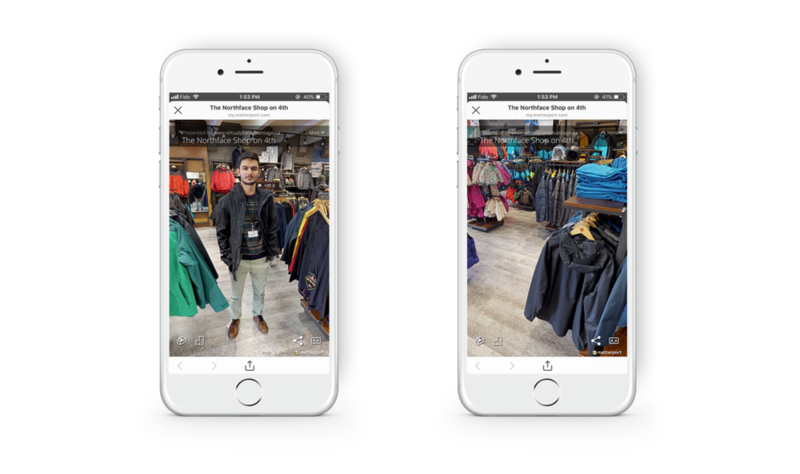 Much like in a Google Map street view, participants were able to tap on different sections of the store on their mobile phone or computer browser to look for the team members inside the store in an immersive, 360 degree view. To complete the challenge, players must take a screenshot of at least one team member and send the screenshot via a Direct Message to The North Face Vancouver's Instagram account to exchange for a stainless steel mug and a $10 in-store credit. To announce the campaign, our graphic designer created a slider template for Instagram with the game’s branded hashtag and images of the various team members the audience needed to locate in the game. The post then directed viewers to the game link via the account bio. Since the overarching goal for The North Face Vancouver's social channels is to drive localized foot traffic to our Vancouver brick and mortar stores, this innovative campaign allowed our followers to explore the interior of the Kitsilano flagship store, where they will see new winter merchandise on the racks as they take their time navigating through the store. To increase interest through gamification, we also encouraged players to share the game with their friends by challenging them to beat their time. Within a week of launching this challenge, The North Face Vancouver inbox was flooded with game entries, which created opportunities for the brand to start conversations and build organic, genuine relationships with their followers. As a result of the carefully planned campaign, we were able to generate 52 game plays organically within the first week with one single Instagram post.